Seriously, this was so good, I can’t wait to eat it again! This is an amalgamation of two recipes plus my memory of the pulled pork sandwich that I love at a local restaurant. Enjoy! For pork: lay onions in bottom of slow cooker. Combine brown sugar, chili powder, garlic powder, cumin, salt & pepper; rub over pork tenderloin, then lay pork on top of onions. Pour chicken broth around pork. Cover and cook on low for 10 hours (7 hours on high). Once pork is almost finished, prepare chipotle honey sauce and spicy coleslaw below. For chipotle honey sauce: whisk all ingredients together to make smooth sauce. Can combine in blender or food processor if preferred. For spicy coleslaw: whisk together dijon mustard, white sugar, red pepper flakes, cumin, yogurt, lemon juice, and salt & pepper. Toss with coleslaw mix, granny smith apples, and green onions. When pork is finished, remove from slow cooker. (Discard liquid and onions.) Shred with a fork, and toss with chipotle honey sauce. Serve on toasted kaiser bun with spicy coleslaw on top, and enjoy! This is a recipe I got from Chef’s Plate and I LOVE this one. It’s got great flavour, it’s super easy to prepare, and it’s fantastic for chilly days! I hope you enjoy it also. Preheat medium soup pot on medium high heat until hot – do not add oil. Add coconut flakes and toast until golden brown, approx. 2-3 minutes. Set aside in small dish until ready to serve. Add 2 tsp oil to soup pot, and heat over medium high heat until hot. Add red onion, red bell pepper, roma tomato, curry spice mix, and red/green chili. Cook for 5 minutes until onions are soft and spices are fragrant. Season with salt to taste. Pat basa fillets dry with paper towel, and season with salt and pepper. Cut into 1″ strips. Add coconut milk, basa fillets, and 1/4 cup of water to soup pot. Bring to simmer over medium heat. Once simmering, reduce heat to low, cover and cook for 3-5 minutes until basa fillets are cooked through (140F internal temperature). Meanwhile, bring 3/4 cup of water to boil in small pot. Add couscous, gently shake so that couscous falls in even layer in pot, cover with a lid and remove from heat. Let sit 5 minutes; add lime zest and half of the lime juice, and a small drizzle of oil if desired; stir to combine. Fluff with fork before serving. Remove fish curry from heat, and stir in snow peas and remaining lime juice. Serve fish curry over couscous in a bowl, top with toasted coconut flakes and cilantro. Enjoy! My Dad is here helping me out with our new little bundle of joy, and we had a whole bunch of shrimp in the freezer. 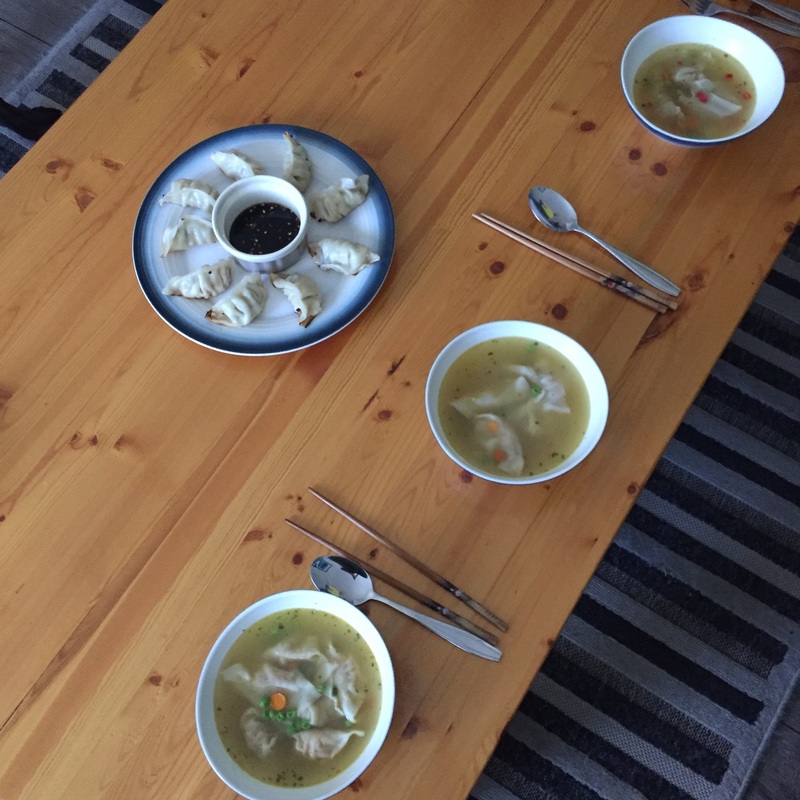 I’m loving Asian cuisine these days, so we decided to make shrimp wonton soup. We found a couple of recipes online and came up with our own based on the ingredients we had rather than making a trip to the grocery stor. We hope you enjoy it- it hit the spot for us! Remove tails and shells from shrimp, and put into food processor or blender. Add remaining wonton ingredients (except wonton wrappers), and pulse until shrimp is in small pieces, almost a paste (not smooth). Lay out wonton wrappers on board, and get small dish of water ready. Divide filling evenly among wrappers, wet edges and fold together however you like to fold your wontons. Set aside. Heat sesame oil in soup pot. Sauté garlic and carrots until fragrant and soft. Add remaining soup ingredients, and wontons. Bring to boil, then simmer 15 minutes on medium-low. 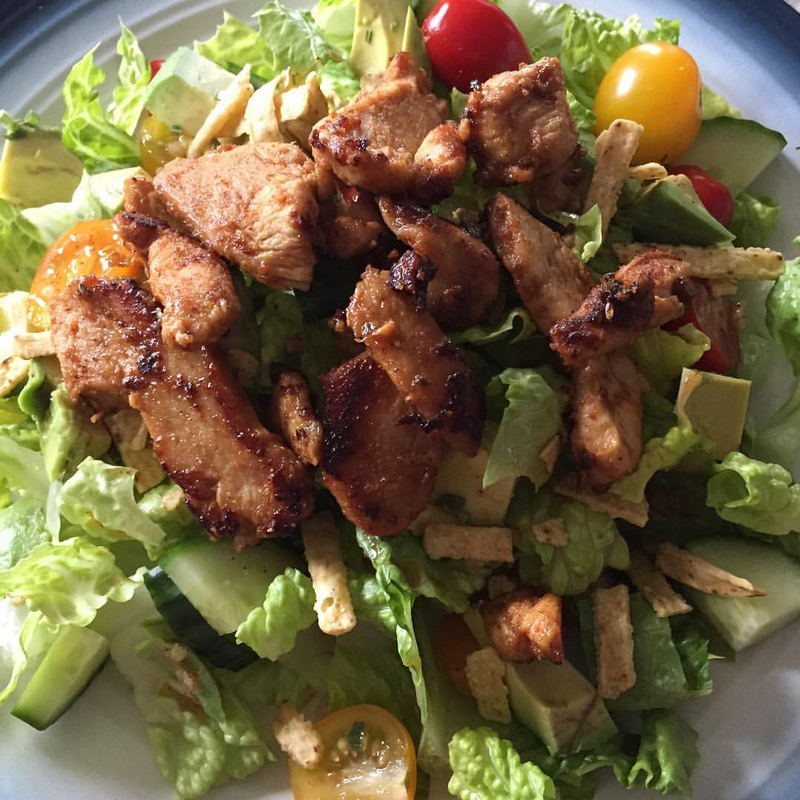 This recipe comes from Chefs Plate; our friends ordered some meals from them and highly recommend their services! This is a recipe she shared with me, and which I have had a few requests already for since posting the picture of my dinner online. Enjoy! Melt butter over medium heat in frying pan. Add garlic, onion, and chicken, and saute until chicken is almost cooked through. Add tomatoes and cream, bring to boil and then reduce to simmer until sauce thickens and chicken is fully cooked. 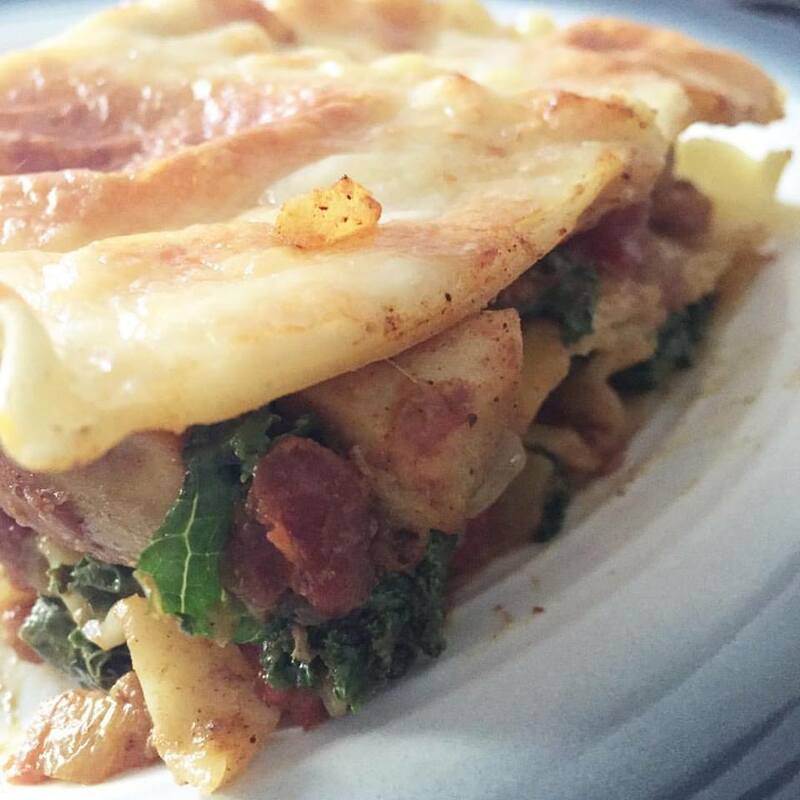 In casserole dish (oven safe), place 2 lasagna noodles to cover bottom, add kale on top, add butte chicken mixture on top, then another 2 lasagna noodles, kale, butter chicken, last 2 lasagna noodles and sprinkle cheese on top. Bake 5 minutes at 450F; turn oven onto broil, and broil 2 to 3 minutes until cheese gets bubbly. I love corn chowder, and I love ham, and potatoes are always good. So of course this soup is now near the top of my favorites list. I hope you enjoy it as much as I did! Heat oil or butter in large soup pot. Add onion, carrots, celery and saute until starting to soften. Add garlic, thyme, and flour, and cook until flour is lightly browned. Slowly add broth, deglazing pan as you go. Add milk, potatoes, and ham, bring to a boil. Reduce heat and simmer until potatoes are cooked. Add corn and simmer until corn is heated through. Season to taste with salt and pepper. It’s almost that time of year again! For a while I’ve been craving a good, soft, homemade gingerbread cookie with that delicious icing and gumdrop buttons. The following is what happens when I have a day off, a great Pinterest find, and cool weather outside. Preheat oven to 350F. Sift together dry ingredients, flour through salt, and set aside. In a mixer with paddle attachment, beat together brown sugar and butter (or margarine). Add egg yolk and vanilla extract. Add molasses and milk, mix until combined. Set the mixer on low speed, and add dry ingredient mixture slowly until fully incorporated. Divide dough into 2 equal portions, and roll each portion between sheets of parchment paper until 1/4″ thick (no thinner*!). 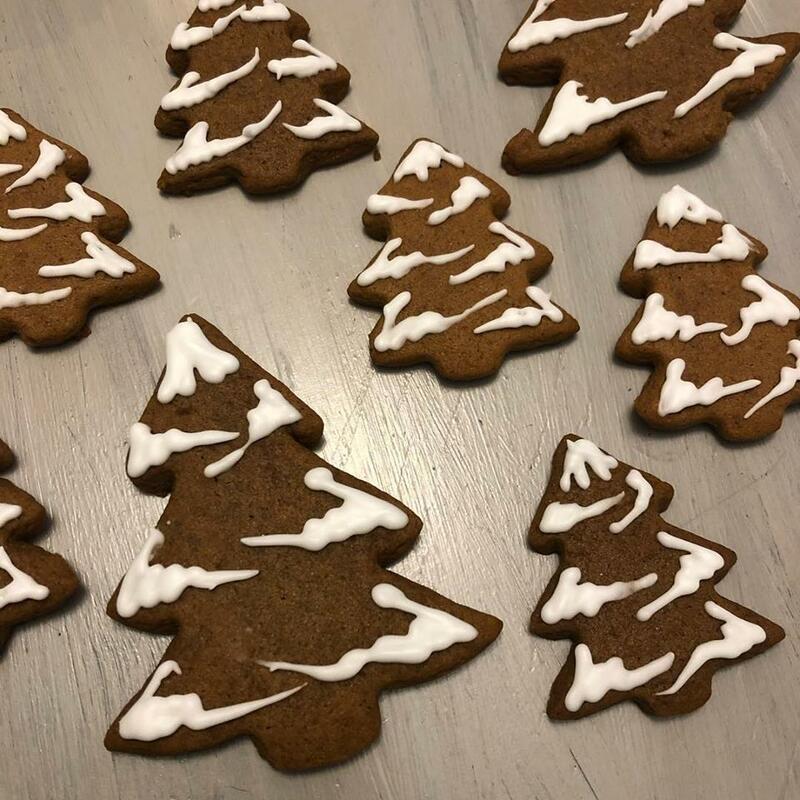 Cut shapes with cookie cutter, but don’t move them yet – place dough on parchment paper onto a cookie sheet or other large flat surface, and chill in freezer for 15 minutes. 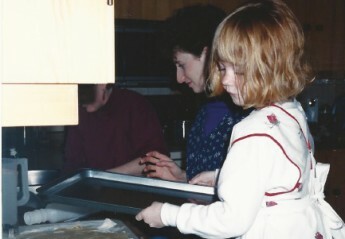 Remove excess dough and transfer cookies to cookie sheet (lined with parchment paper). Bake for 8 minutes at 350F. Cookies should be soft and stay indented when touched. Let cool 2 minutes on cookie sheet, then transfer to cooling rack. When cool, decorate with icing and gumdrops, sprinkles, etc. *Pour a small amount of canola oil into liquid measuring cup and swirl around to coat before pouring molasses – this is a great trick I’m sure many grandmothers have handed down. Doing this means your molasses won’t stick to the measuring cup. **Seriously, I went too thin on one batch and burnt them at the same time and temperature as the others. If anything, go thicker and add 1-2 minutes to the bake time. And don’t skimp on the time cooling on the pan either. Or in the freezer. Beat egg whites on high in mixer until frothy; add lemon juice and icing sugar, and beat until thick on high. Transfer to piping bag or Ziploc bag with tip cut off for decorating. Add food colouring if desired. Original cookie recipe here, and original Royal Icing recipe here.